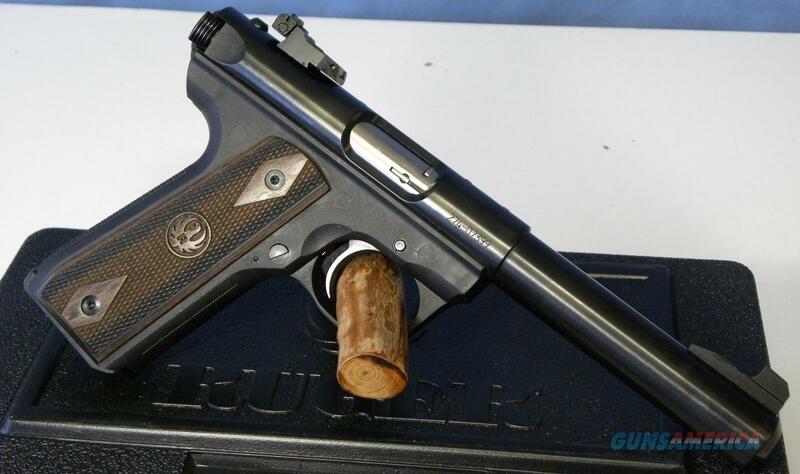 Description: NEW RUGER MKIII 22/45 TARGET WITH REPLACEABLE LAMINATE GRIP PANELS WITH 5.5" BULL BARREL. THIS IS AN AUTO-LOADING PISTOL WITH A BLUE STEEL UPPER AND BLACK SYNTHETIC FRAME IN .22LR. DRILLED AND TAPPED UPPER RECEIVER WITH FIXED FRONT SIGHT, REAR ADJUSTABLE SIGHTS, HAS MANUAL SAFETY, SINGLE ACTION TRIGGER SYSTEM, TWO TEN RD MAGS AND WEAVER STYLE SCOPE ADAPTER. COMES WITH LIFETIME WARRANTY, LOCK AND MANUAL.